<img class=”alignright size-medium wp-image-1595804″ src=”https://www.catholicconvert.com/wp-content/uploads/88C7760D-3913-4563-ACE8-57643B1AE8AA-300×252.jpeg” alt=”88C7760D-3913-4563-ACE8-57643B1AE8AA” width=”300″ height=”252″ /> We are very excited, Janet and I, to welcome the Ave Maria Radio Group and lots of their friends to the Holy Land. Ever since I first came to Israel it has been my dream to bring Al and Sally Kresta with me. Today is a dream come true as Al and Sally Kresta landed in the airport in Tel Aviv. I am not expressing any opinion here. I am just posting three of the many articles about a Papal Correction which is taking the Catholic world by storm. Because Pope Francis is refusing to explain his teachings there is a justified response and request for clarification or correction. Read and consider this historical situation and pray. The initiative, the first time such a mechanism has been used since the Middle Ages, accuses the Pope of “propagating heresies” and respectfully asks that he teach the truth of the Catholic faith in its integrity. A group of clergy and lay scholars from around the world have taken the very rare step of presenting Pope Francis with a formal filial correction, accusing him of propagating heresies concerning marriage, the moral life, and reception of the sacraments. Entitled Correctio filialis de haeresibus propagatis, meaning ‘A Filial Correction Concerning the Propagation of Heresies,’ the 25 page letter was delivered to the Holy Father at his Santa Marta residence on Aug. 11. The Pope has so far not responded to the initiative, whose 62 signatories include the German intellectual Martin Mosebach, former president of the Vatican Bank, Ettore Gotti Tedeschi, and the superior general of the Society of St. Pius X, Bishop Bernard Fellay (he learned of the document only after it had been delivered to the Pope and signed it on behalf of the Society). Read the whole article HERE in National Catholic Register. Another good article from The Catholic Thing HERE. 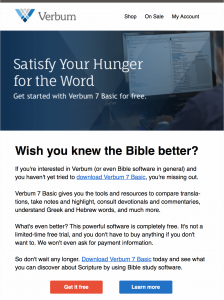 L If you’ve followed my blog for long you know I love the planet’s best and only Catholic and Bible Software called VERBUM. I have been using this since 1990 and it is loaded on my desktop, laptop and iPhone all the time. I live on this program. I’ve used it to write all my books, scripts for my movies and answering the 1000’s of questions I get. Depending on which version you get it has the Catechism, Catholic Bibles and commentaries, Fathers of the Church, Atlases, Timelines, writings of the Popes and much more. Now you can get it for FREE. Check it out here, get if for free here.